State regulators and grid operators have stymied the president's bid to revive the coal industry. So federal officials are increasingly playing their trump card: national security. Energy Secretary Rick Perry cited national security in his proposed bailout of struggling coal plants last year. National security was again at the center of a leaked Energy Department plan to use a Korean War-era law to prop up faltering coal plants this year. And this week, Interior Secretary Ryan Zinke said Washington is looking at military bases as potential export facilities for coal and natural gas, enabling energy companies to circumvent the opposition to proposed terminals in West Coast states (Greenwire, Oct. 15). "I respect the state of Washington and Oregon and California," Zinke told the Associated Press. "But also, it's in our interest for national security and our allies to make sure that they have access to affordable energy commodities." The Constitution vests considerable power in the president to act in the name of national security. But analysts say the increasing invocation of national security highlights the limited tools available to the administration in its effort to aid the coal industry. Power markets are traditionally the domain of state regulators. Complicating matters is the move in recent decades toward competitive wholesale power markets, where the abundance of cheap natural gas continues to push coal plants into retirement. 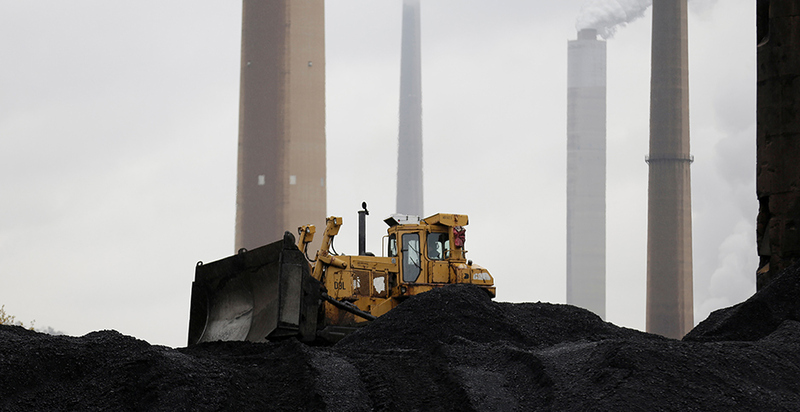 "Just the sheer economics of coal, internationally and domestically, make it hard to find an economic fix for coal," said Susan Tierney, a former Energy Department official in the Obama administration. "They just keep looking for cards to pull out of the deck. The president has extraordinary powers when it is tied to national security. So he's just trying anything he can in that domain." Those powers have thus far failed to impress the Federal Energy Regulatory Commission, which has authority over competitive wholesale power markets. Perry premised his initial proposal on the idea that coal plants are essential to the resilience of the U.S. electric grid. FERC unanimously rejected the plan, echoing the findings of grid operators, which say they can maintain the power system in the face of widespread coal plant retirements. But that could change. The Trump administration has nominated a DOE official to fill a recent vacancy on the commission, raising industry hopes of pursuing a similar proposal there again (Energywire, Oct. 4). Coal companies have made similar arguments when it comes to exports. "The development of an export terminal in the Pacific Northwest of the United States would significantly enhance U.S. allies' access to secure, high-quality, low-sulfur coal and should be welcomed on both sides of the Pacific," said Rick Curtsinger, a spokesman for Cloud Peak Energy, a Wyoming-based company that exports coal mined in Montana through a port in British Columbia to markets in Japan, South Korea and Taiwan. Reaching Asia has proved difficult for U.S. companies. West Coast states have formed a "thin green line" in opposition to a series of proposed coal terminals in the Pacific Northwest. Of the three projects once planned, only one remains — and its future rests on shaky legal ground. Washington state regulators have rejected a series of environmental permits for the facility (Climatewire, Oct. 11). The project's developer has filed a federal lawsuit accusing the state of violating the Constitution's commerce clause, but many legal experts say that bid faces long odds. The rights of states to issue environmental permits are generally well enumerated, they say. It's against that backdrop that the administration has turned to national security to bolster its arguments to help coal. The question, analysts say, is how far that logic can be pushed in the name of economic policy, given almost certain legal challenges to any administration proposal. "When you want to intervene in the energy markets, national security is the nuclear option," said David Victor, co-director of the Laboratory on International Law and Regulation at the University of California, San Diego. "That's what they tried to do with the reliability order, and it sounds like what they're trying to do here." Zinke's export plan faces a series of logistical questions, according to industry analysts. Any potential coal terminal would need adequate rail service and access to a deepwater port. But it could be further complicated by political questions. Any spending on a coal terminal would likely need to be approved by Congress, said David Hayes, a former Interior official in the Obama and Clinton administrations. It would be also subject to a federal environmental review, a process that would likely take years. And that's before considering the precedent of allowing a private company to use U.S. military installations, he said. "If this were allowed, where does it stop?" said Hayes, who now leads New York University School of Law's State Energy & Environmental Impact Center. "This is so far afield from the military's definition of national security. I can imagine any number of businesses who would love to use U.S. airfields to facilitate U.S. exports of all kinds." Coal analysts, for their part, reacted with skepticism to the idea. Strong Asian demand has boosted prices for thermal coal used in electricity generation. If such a port existed today, companies would likely be able to successfully sell into the Asian market. Yet most forecasts show Asian coal demand slowing in future years, raising questions about the economic viability of a project with a price tag in the hundreds of millions. "We never really imagined that there were federal ports with infrastructure, and maybe there aren't," said Matt Preston, an analyst who tracks the industry at Wood Mackenzie. "It might be like resilience. It's an idea; we just don't know how good of an idea it is."